Here are links to a selection of useful downloadable documents available in Adobe Acrobate PDF format. More useful resources are going to regularly added to the site. Sign up for the Waterlow Newsletter to be notified when resource updates have been added. You need to have the Adobe Acrobat Reader installed to view the files, many new computers come with Adobe Reader already installed. If you don't have it you can quickly download it free by clicking the link below and visiting Adobe's download page. One side illustrates the risk assessment scoring system click here. The reverse side provides guidance on nursing care, types of preventative aids associated with the three levels of risk status, wound assessment and dressings click here. 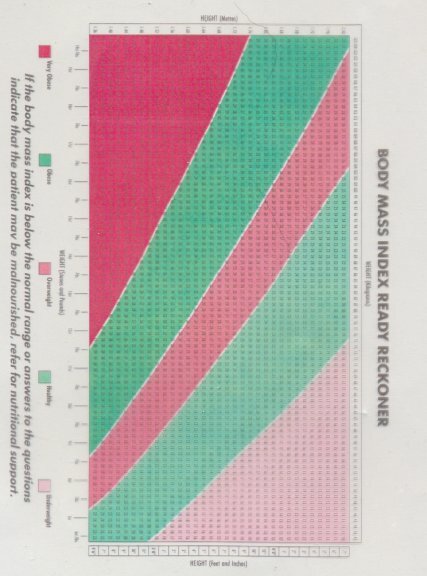 A very useful and clear Body Mass Index chart. Plan your patient's daily movement and turning regime by using this generic turning chart. By signing up to our download members list we will update you on any added documents.